Our Heroes are eating lunch when Sheldon states the problem with teleportation. As he is going on Dr. Gablehauser comes up to introduce the newest prodigy, 15-year-old Dennis Kim. Sheldon says he was doing his masters at 14, Dennis says he lost a year when his family was tunneling out of Korea. Leonard chimes in with point Dennis. Dr Gablehauser wants Leonard and Sheldon to show Dennis around (Why he would want Sheldon to is way beyond my little brain). When Dennis points out he knows they don’t have the best equipment, Gablehauser points out that they will turn a blind eye to Dennis using part of his grant to get his grandfather out of Korea. Dennis says he knows the string theory project is a dead ends and Sheldon points out that String Theory is his project, Dennis lets him know he is going to hit a dead end…Sheldon doesn’t believe him. Dennis tells him he will. Leonard holds Sheldon down. Gablehauser walks away and Sheldon senses a disturbance in the force…Cue music. Leonard, Sheldon and Dennis are walking in the halls at the University. Leonard asks how long Dennis has been in the States. Dennis says a year and Leonard thinks Dennis speaks well. Dennis says Leonard speaks well except he ends sentences with prepositions. Sheldon agrees with Dennis. They get to Sheldon’s office and Sheldon says goodbye. They follow him into his office where Dennis corrects Sheldon’s work. Sheldon has an award and mentions he was the youngest to win it, Dennis asks how old, Sheldon replies, Dennis tells him he was the youngest to win it. Dennis and Leonard leave. We get to the guys apartment with everyone eating dinner. Penny tries talking to Raj; he still can’t talk to her with out being drunk. She hugs him when Howard says he needs a hug, Penny tells Raj to hug Howard (score one Penny). Sheldon is feeling down and as if his life is over. Leonard tries to get Sheldon to eat. Sheldon didn’t think anyone would come along who would be younger and smarter until androids were around. He insults Penny, who wants to know why the guys are friends with Sheldon anyway? Howard says it is because they like Leonard. Sheldon decides to give up and goes to bed. Sheldon comes out to tell Leonard he was right. Sheldon has decided to collaborate with Leonard, as soon as Leonard tells Sheldon what Leonard does. Apparently Sheldon has not been listening. Sheldon looks at Leonard’s work at wants to know why they are not using a different kind of laser and Leonard explains it would make everything blow up. After some more Sheldonisms, Leonard tells Sheldon to GO AWAY. We then flick to Howard on the phone in his lab telling his mother there is no ding dong in this lunch bag (I think the ding dong is holding the bag). Howard looks up and there is Sheldon. Sheldon refers to the engineers as the Oompa Loompas of science. 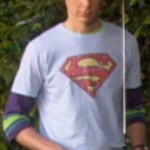 Howard gets frustrated with Sheldon and tells Sheldon to GO AWAY. Sheldon wants to know if Leonard told Howard to say that. Sheldon walks away trying to figure out why they would both say it. Camera goes to Raj walking out of his office pointing and saying GO AWAY. Sheldon walks out. Howard sticks his head in the door at the boy’s apartment and asks if Sheldon is there, Leonard responds if he was Leonard would not. The guys discuss that they need to do something for Sheldon. They decide they need to get rid of Dennis. Leonard asks if they are going to kill Dennis and they decide against that. They decide the best way to distract a 15 year old boy is to introduce him to girls. Apparently girls can distract a world-class mind. Sheldon walks in and tells the guys if they all stop what they are doing, they could all together lick cold fusion in 10 years, 12 tops…. Sheldon looks at all their faces and says Go Away? They all nod yes, Sheldon wonders out loud if it could be him! We pan to Howard, Raj and Leonard knocking on Penny’s door. When Penny answers, they tell her they need a 15-year-old hot, smart Asian girl with a thing for smart guys. Leonard says that is racist any 15 yr old girl will do. Penny gives them a look, and slams the door in their faces. Raj thinks she might have misunderstood them! We see Sheldon working on a map he explains to Dr Gablehauser and Dennis; he has decided to build an exact replica of Jerusalem in the middle of the Mexican desert. Like the baseball movie, if you build it they will come. As Dr Gablehauser and Dennis leave Sheldon’s office, Gablehauser tells Dennis -Sheldon is crazy. We are at Dennis’s welcome party where Sheldon is trying to Understand why they can’t move the promise land. Gablehauser wonders aloud why there are so many young women at the welcome party. Leonard explains it is take your daughter to work day. Then Raj under his breath explains how anyone whose insurance files indicated they had daughters between 14-16 got the “bring your daughter to work” day. Leonard and Howard are glad it worked! Dennis walks in and Gablehauser walks over to talk to him. Leonard realizes the flaw in the plan is that Dennis might not know how to talk to girls. The guys decide to help. Raj points to one girl and Howard tells a sob story, he points to another girl and Leonard tells a sob story. Raj points to a third girl and they decide on her. Raj says if they were in India this would be easier as they are talking Gablehauser starts a toast and looks for Dennis Kim. Dennis walks in with a hot girl. Dennis leave to go to the mall with Emma. The guys are impressed the kid got a girl and Howard wants to know if anyone saw how he did it. Sheldon steps in and gives a speech how he will never fall into a personal relationship and that social relationship will continue to baffle him and his research will go on. Everyone claps. We see the boys walking with model rockets through a park. Howard is upset that he got a ticket. Leonard tells him maybe he shouldn’t have told the female officer that he had another rocket in his pocket for her. As they are talking they see Dennis Kim, sitting on the ground with a group of girls around him drinking out of a paper bag. The guys are feeling bad til a hot girl starts kissing him, Leonard doesn’t feel like they ruined his life at all and Sheldon says he was weak.